Use this interactive home search to see current MLS listings of homes for sale. If you find a home that interests you or want a tour of this neighborhood, call Jim at 512.913.1557. NOTE: Since this is a new construction neighborhood, all of the listings may not map correctly. 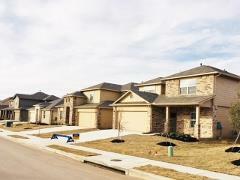 Neighborhood Location: The Reserve at McKinney Falls neighborhood is located east of IH-35 in Southeast Austin. Take exit #228 (William Cannon Dr.) off IH-35, then go east from IH-35. In about 3 miles, turn left at Janes Ranch RD. The entry sign is straight ahead. Scroll down to see more info on The Reserve at McKinney Falls. Click link to see featured Southeast Austin Neighborhoods, with an interactive Google Map. The data below is designed to give you an overview of home sales in the The Reserve at McKinney Falls subdivision. Data will be added yearly. The Reserve at McKinney Falls Southeast Austin real estate market data from Austin Board of Realtors, 1/1/2017-12/31/2018. 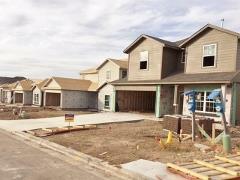 This subdivision, a development of DR Horton Homes, was begun in 2017, and is progressing well in its early stages. The first MLS-recorded home sale was dated 9/28/2017. The Reserve at McKinney Falls offers homebuyers eleven (11) different floorplans with 1,472 to 2,812 sq. ft. of living space. In February 2018, the base price for these homes begins at $249,900 and reached upward to around $300,000. The three single-story homes have from 1,472-1,654 sq. ft. and 3 bedrooms. The eight two-story plans offer from 1,779 to 2,812 sq. ft. with either 3 or 4 bedrooms. These new homes will offer many features that may be upgrades in other communities, including granite countertops in the kitchen. With their energy-efficient and other features, you will enjoy making one of these homes yours! 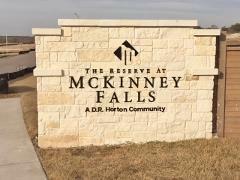 AMENITIES: The Reserve at McKinney Falls neighborhood will have a community amenity center. All facilities in the neighborhood are for the use of homeowners and their guests. SHOPPING AND ENTERTAINMENT: Nearby "things to do" and "places to go" include Southpark Meadows (at IH-35 South and W. Slaughter Ln.). This development is a "go-to" shopping and eating venue with big-box stores (a Super WalMart, Target, Sam's and Best Buy, e.g. ), and many eateries, banks, a movie theater, several furniture stores, small businesses, and more. Other places of interest are located at the intersections of IH-35 and William Cannon/Stassney, south of Austin in Buda (Cabela's) and Kyle, and in areas toward Austin. GOLF AND PARKS: Golfers can play a round at the Plum Creek Golf Club in Kyle, and the City of Austin's Grey Rock (Circle C Ranch), Clay and Kizer golf courses. There are two multi-featured park facilities close by: the McKinney Falls State Park (Texas Parks and Wildlife) and the Mary Moore Searight Metro Park just off W. Slaughter Ln. (City of Austin-owned). TRAVEL: Travel to the airport (ABIA) via McKinney Falls Parkway is fairly easy, as is getting to Downtown Austin and other locations via IH-35. 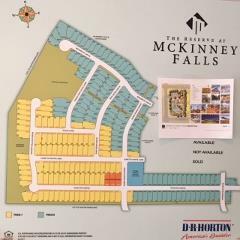 Owners of homes in the Reserve at McKinney Falls must maintain an active membership in the neighborhood HOA (homeowners association). Monthly fees in February 2018 are $59. Property owners in The Reserve in McKinney Falls pay taxes yearly at a 2017 tax rate of around $2.48/$100 of assessed value. Taxes are assessed by the City of Austin, Travis County, and the Del Valle ISD, along with two others. The tax rate varies from year to year. Students living in the The Reserve at McKinney Falls community attend schools of the Del Valle School District. Potential homeowners should confirm the currently-assigned schools with Del Valle ISD.